I have a custard addiction. And I recently discovered that custard is socially acceptable to eat at breakfast. I don’t know why it took so long to find this out. I haven’t had enough exposure to doughnuts I think. So I immediately made lemon curd. And after I spooned it into the jar, I licked every last vistage from the bowl. Because I really, really don’t like to be wasteful. That was my thinking. And no one was around to tell me my thinking was flawed. Zest, lemon juice, sugar, eggs, butter. Then you will need a makeshift double boiler. This consists of a pot with a bit of water in it, and a bowl that will fit inside but not touch the bottom. You’ll drop your eggs into the bowl and give them a mix as the water comes to a simmer. The mixture will be pale from the air you’ve incorporated. And as the water heats, it sends off steam which will warm the bowl and slowly thicken the egg mixture. You want to keep stirring constantly here, making sure to get the sides of the bowl as well. As soon as you see it begin to thicken, that’s when you turn off the heat. Then you’ll want to switch to a wooden spoon or spatula so you can really get the sides. Then you’ll lift the bowl out and keep stirring as it cools. This will prevent it from getting lumpy. But if you do end up with lumps, do not fear, simply strain the mixture through a fine mesh strainer and it will be perfect. Next you add the butter and mix it in until it melts. This will prevent a “skin” from forming on the surface of the custard. And there you have it, thick and tangy, perfect for your morning toast or by the spoonful. 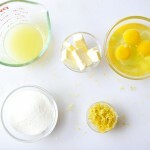 In a double boiler, combine the eggs, lemon juice, zest, sugar and salt. Whisk them constantly as the water comes to a simmer until the mixture begins to thicken, about 10 minutes. Just as it thickens, switch to a wooden spoon or spatula and continue to stir, making sure to scrape down the sides of the bowl. Remove the bowl from the heat and continue to mix for 2-3 minutes as it cools. Add butter and incorporate completely. Store in a glass jar or bowl, fully covered for up to 2 weeks. K Georgia I am happy for you but when I try to eat it I feel like my salivary glands explode and my eyes pop out of my head!!!! Too much for me! So are you saying that too much of a good thing is a bad thing? I think it was magically delicious. I also believe that too much of a good thing is a better thing, or at the very worst still good. I agree with Jason! 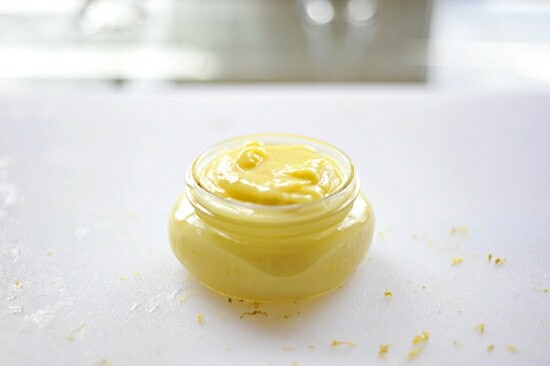 Plus he got to try some at the pickling class this past weekend so he's officially an authority on lemon curd.